Frank van Dalen is a political advisor, human rights activist, and entrepreneur. He specializes in successful campaigning. He gained experience as President of the Dutch LGBTI-advocacy organization, COC Netherlands, and as Chair of Pride Amsterdam. He was also a campaign leader for a political party. Now, Frank van Dalen chairs the political knowledge foundation Political Academy and serves as the CEO of E-canvasser.com. 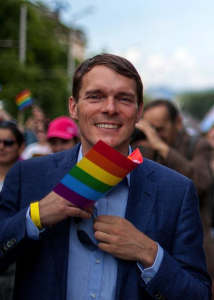 Additionally, he is Vice President of the international association of Pride organizers known as InterPride, and he chairs the LGBTI Workgroup of the Human Rights Committee of Liberal International. Frank is also a global representative for Copenhagen Pride, which is hosting World Pride 2021. Pride is, by far, the largest movement with a proven ability to bring millions and millions of people into the streets every year. InterPride has the task, now more than ever, to support the development of Prides around the world, and to connect all Prides’ voices into a single globally-networked force for the advancement of LGBTQI+ equality. But, we are only able to do this when InterPride is able to connect Pride movements globally with one another and is itself connected with the world. When InterPride is a strong and professional external-oriented organization. When InterPride is relevant for its members and seen as an impactful force on a world stage. As Vice-President, these are the three themes I will work on.